The time data values are in the last column of the data memmap, not in the first as the example sugests. Did you change some index value when converting from python2 to 3? I've tested my code version over the file simulacao.pl4, and I could confirm the issue that you are commenting. 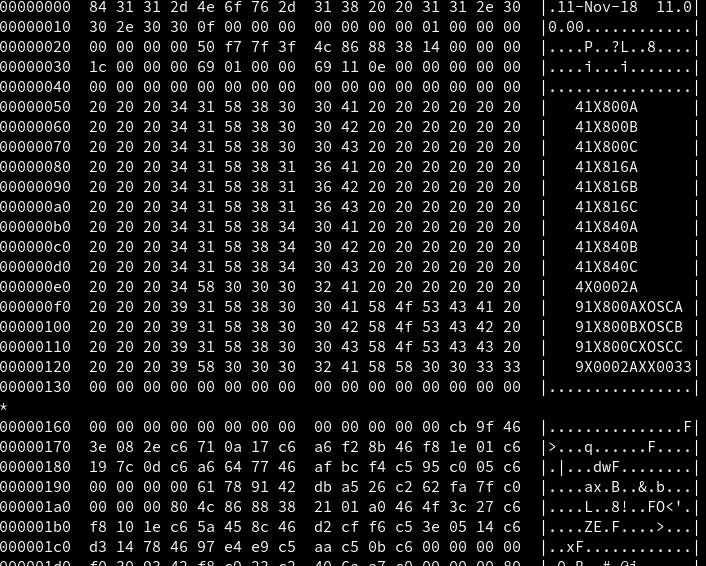 However, opening your pl4 file with hexdump I could verify that you file is slightly different than mine. Mind that your data skips from row 0000130 to 00000160 when it changes from variable description to actual data. Moreover, in your file seems to exists a row of zeroes before the actual data in row 00000160, which doesn't happens in mine. Also consider that your variable 1X800A-TERRA (node voltage) is not zero at t=0.0, as it may suggest reading you binary file with the structure that I discover from my pl4 files. Conversely, in my pl4 file we don't see this row bump. This may suggest that your pl4 format is different from the one that I'm using. In doing so, please check your ATP startup file, as described above. You can check my binary data file here.. Would be interesting also to check what atp solver version we are using, they may differ. I don't know the version of the solver. Do you know how to check the version? The file name is tpbig.exe. Sorry to taking so long to reply. Things are pretty wild here. I don't know how to check which solver version the case has been simulated. I just know the version by checking it when downloading from ATP solver, and then marking it somehow. I'll e-mail the ATP mailing list to see if there is some way to do this. So we already know that this issue doesn't come from NEWPL4 flag. I will strike through it above. Thanks. I did further comparison on our binary files, besides the fields that we already know, only the fields painted as green in the figure below differs between our files. In doing so, I believe if there is some clue about these additional rows of zeroes it must be given in these fields. The fields painted as red are filled equally. We could as well compare both ATP's startup file and simulation data case (especially the misc data cards. I would like to know the root of those additional zeroes. I did thought a way to strip out those unwanted zeroes rows. As we know the complete size of PL4 file (PL4 SIZE), the number of variables, the header length and so on, we can calculate how much of undesired data is in in between the actual simulation results and the variable description. Hence, we can skip them. I'll write a proposal and commit it. Please test it with your data. Proposal for solution of issue #2.